It wasn’t just Colorado cities and counties along with Iowa communities voting this week. Back east, Greenfield, Massachusetts also rushed to the polls to support local Internet choice. Greenfield is planning to use a combination of fiber and Wi-Fi to deliver services - an approach that has had limited success in the past due to the technical limitations of Wi-Fi. At Tuesday’s Annual Meeting, residents voted on the future of high-speed Internet access in the town. The referendum, the first step in creating a municipal broadband network, saw a landslide victory. The people gave a resounding message that they wanted to pursue a network: 3,287 people voted in favor; only 696 were opposed. According to the local paper the Recorder, this nonbinding ballot referendum allows the town to create a nonprofit to run the municipal broadband network. Currently there is a pilot program on two streets – giving residents a taste of community-owned high-speed Internet. This pilot program started in mid-October and provides free Wi-Fi on Main and High Streets. If voters had rejected the ballot referendum, the town would have ended the pilot program and only created an institutional network for the municipal and school buildings. Now, with the referendum passed, they can implement the plan for high-speed Internet access. In mid-September, Hudson, Ohio launched its Velocity Broadband service, bringing 1 gig connectivity to a large business complex. The commercial site is the first in series of industrial areas where the city officials plan to bring the network in the coming years. The community, located near Akron, hopes to eventually bring Velocity Broadband to residential areas. "It's moving faster than we thought," said City Manager Jane Howington. "Demand has been much greater than we thought." According to the city’s Broadband Needs Assessment, Hudson is building the network in response to significant problems with the city’s existing broadband options. Small and medium sized companies complained to the city’s consultants on the network that they have “learned to live with” problems of poor reliability, performance, and affordability of the city’s broadband services. They said even the best available broadband service options over DSL and cable are inadequate and negatively affect their ability to do business. City officials plan to continue rolling out access to the city’s downtown area next year and to other business areas soon after. Although the city of 22,500 has no timeline on residential service, city officials have expressed the intent to eventually bring the fiber optic network to every home. A lot has happened in Sanford, Maine since our last report on their municipal fiber optic network discussions. After a year of deliberations over different proposals, the city recently announced plans to begin building a 32-mile municipal fiber-optic network. The city of Sanford is inside York County, situated about 35 miles southwest of Portland. The network will provide connectivity to businesses, government entities, non-profit organizations, and residences in Sanford along a limited route where there is sufficient customer density. City leaders plan to also provide a foundation for future expansion of the network to additional residential areas in the city. The network will be open access, allowing multiple ISPs to provide services via the publicly owned infrastructure. The city will partner with Maine-based company GWI (Great Works Internet) to operate the network. Readers may recognize GWI as the same company working with Rockport, Maine's first community to invest in a municipal fiber network. Once they complete the buildout, Sanford will be in an elite class of a just few cities nationwide that provide widespread access to 10 Gbps broadband. It is a bold plan for this city of just over 20,000 in a state that last year ranked 49th in the nation in average broadband speeds. At a September meeting, the City Council in Peachtree City, Georgia unanimously approved a resolution to construct and operate a fiber-optic broadband network. According to the City Council minutes from the meeting, the initial 22.54-miles of fiber will provide 1 Gbps broadband access to various facilities in the City Service area. Officials estimate the network will cost $3.23 million. To pay for the project, the Peachtree City Public Facilities Authority, an independent local government authority created by the state legislature in 2011, will enter into an intergovernmental agreement with Peachtree City. According the August 2015 Fiber Initiative plan, capital for the project will come from the Authority; the city will issue a bond and pay installments to the Authority under an Agreement of Sale. For several years now, the city located 30 miles southeast of Atlanta has explored options to improve local connectivity. City leaders tried and failed to bring Google Fiber to the community of 35,000 people in 2010. The city attempted repeatedly to urge private ISPs like AT&T to address the problem with no success. In February of this year, city leaders began work on a study to explore the feasibility of a publicly owned fiber network. City Council members citizens at the recent City Council meeting expressed concerns that the network will not pay for itself and taxpayers will be left to cover unpaid costs. According to a recent survey of local businesses, 100% of respondents reacted positively to the prospect of a municipal network for connectivity. At a Chicago City Council meeting this month, a newly elected alderman proposed the city stop relying on incumbent ISPs and start using its existing fiber network for connectivity. Pointing to nearby cities like Aurora, where municipal government eliminated leased lines to reduce costs by $485,000 per year, Alderman Brian Hopkins suggested the switch could save the city “tens of millions of dollars” annually. He also advocated the change in order to provide more efficient services. Hopkins’s comments come on the heels of a resolution we reported on earlier this year from four powerful Chicago City Council members calling for hearings on how to use city buildings, light poles and high-speed fiber-optic lines for a wireless network that could raise the city millions. The city is trying to find ways to generate revenue amidst a major $30 billion employee pension crisis that led Moody’s to downgrade the city’s bond rating to junk status in May. Washington, DC, continues to operate an incredibly successful municipal network. 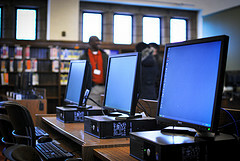 Created in 2007, the municipal government’s 57-mile fiber optic network, DC-Net, provides connectivity to government buildings and community anchor institutions that are health or education based. DC-Net started providing public Wi-Fi hotspots in 2010. We covered some of the savings of DC-Net itself in our 2010 report, and we recently found a report from 2012 that details an example of public savings from the network. In 2008, the Office of Personnel Management in D.C. needed to replace its aging phone system with state-of-the-art Voice over IP and a video conference system. These two telecommunication systems require a high capacity network. After a market analysis found that prospective vendors would cost more than the budget could handle, they had to find an alternative solution. That’s when they connected with DC-Net. The network kept costs down - the initial cost-savings from the project were about $500,000. DC-Net also provided more than Office of Personnel Management had originally anticipated: redundancy, more connectivity, and better coverage. With the added redundancy, the phone and Internet have had less outages. DC-Net then provided gigabit ethernet to the headquarters and Wi-Fi coverage. The total cost savings for the Office of Personnel Management over the first 6 year period (from 2008 to 2014) are estimated at $9.25 million. They came in at budget with more connectivity than they had anticipated by using a municipal network that was committed to meeting their needs. Sounds like a good deal to us. Boise, the Ada County Highway District (ACHD), and Boise State University (BSU) have entered into an agreement to deploy fiber along a busy downtown Boise corridor. The high-speed lines will supply connectivity to a new building BSU intends to lease as a facility for Computer Science Department students. The fiber will also connect the BSU Bookstore. The city will use the fiber to connect its City Hall and a Police Department substation located on the BSU campus while ACHD will add this fiber line to its current fiber network to control traffic throughout the city. According to an Idaho Statesman article, the city has been installing conduit on campus, connecting it to ACHD conduit situated in the downtown core during the past year. Conduit installation cost the city approximately $47,000; BSU will now install fiber in the conduit at a cost of approximately $75,000. ACHD will contribute a section of its own conduit to complete the connection and will provide the permits to install the fiber. At some point, Reno said, the city wants to connect the Boise Depot, the original railroad depot on the Bench south of the BSU Campus that the city owns and rents out as a venue for business meetings, weddings and other events. This agreement will allow each entity to own one-third (48 strands) of the entire fiber line (144 strands). The city will continue to own the conduit that is in place and will own all newly-installed conduit and vaults located on city property or in the ACHD rights-of-way; any conduit installed on University property will belong to BSU.